Why do we design and manufacture this machine? Production line of manufactured sand at present, mostly utilize a wet production craft, regardless adopting any style of the sand washer, its biggest weakness is that the fine sand(≤0.16mm) runs off seriously, have of even run off 20% above, this not only decrease the yield, but also seriously influence the sand gradation, which results in the gradation being not reasonable, the fineness module being partial to thick and largely lowering the product quality of the manufactured sand. Too many fine sands are exhausted will also result in the pollution of the environment. In order to solve the above questions, we research and manufacture the SS series Sand Recorery System. which is designed on the base of absorbing the world advanced technology. They are utilized widely in aggregate processing system, the processing system of glass raw material, the production line of manufactured sand, and so on, they can solve the fine sand recovery questions. 1. The system is composed of the motor, pump, cyclone, vibrating screen, pool, recycling box. 2. Working principle: The compound of sand and water is transported to cyclone, the sand that centrifugal classification concentrate provided to the vibrating screen by the heavy grit, sand and water are effectively separate after vibrating screen dehydration. Through Recycling Box, fine sand and mud and so on returned again to the pool, then are exhausted from the exit when the liquid surface of pool is too high. The material weight concentration recovered by the vibrating screen is 70%- 85%. Adjusting fineness module may come true by changing pulp concentration, adjusting the flooding water yield, changing the grit mouth, then fulfilling its three kinds function— washing, dehydration and screening. 1. The sand washer is utilized to wash sand and dehydrate water of the manufactured sand in its traditional wet processing craft, the losses of the fine manufactured sand almost can not be controlled. 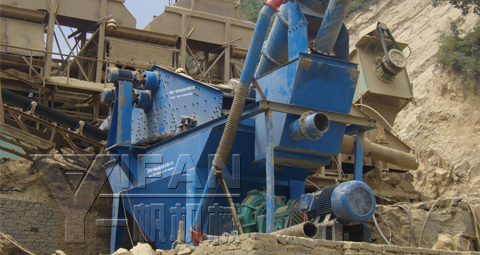 Utilizing SS series sand collecting syetem can effectively reduce the fine sand losing. This system nicely solve the difficult problem, which refers to the fineness module of sand be partial to tkick, while the power be low in the aggregate processing system. 2. The vibrating screen utilizes polyurethane mesh, which has longer life and uneasy to be blocked. 3. Inner the polyurethane, strengthen the whole device service life, it can smoothly finished the Work of condensing slime and clearing the liquid etc. 4. The maximum fine grain materials quantity recovered from the total effluent is 85%, so it has unsurpassed technology and economic advantage compared with other equipments. 5. The find sand are recovered sufficiently, you can reduce the sedimentation basin workload and Low its clean cost. 6. Reducing nature stock time of the fine material, they can be transferred directly and supplied to the market. 7. We can design corresponding solve project according to our consumers, different requirements.